Frankenstein is ready for this close up! 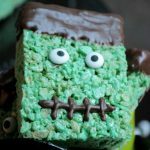 Frankenstein Rice Krispie Treats will be sure to bring the party to life! This is Halloween, This is Halloween! In this town we call home, everyone hail to the pumpkin song…. yes the song from The Nightmare before Christmas has been stuck in my head all week! I do believe that it’s because Halloween is only a few weeks away!! Who’s ready? I know I am! While I may not be into making “gross” and “gory” Halloween foods I do like to make some things that scream “Halloween”. 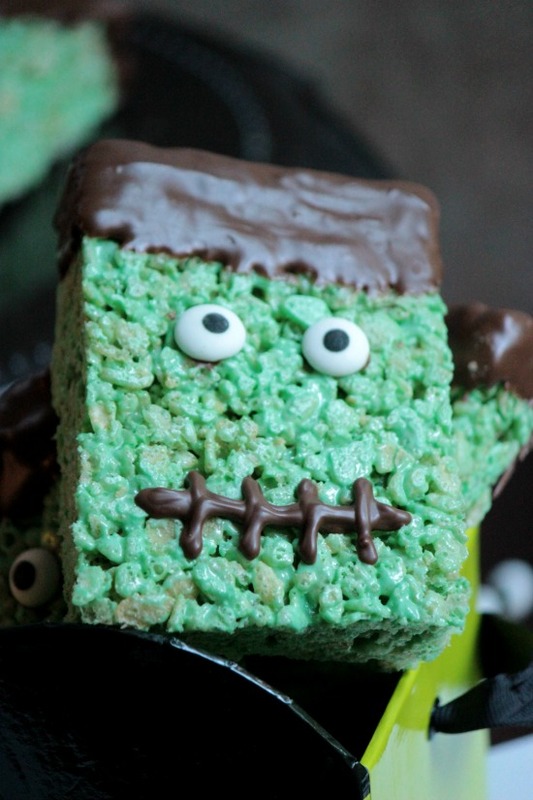 Frankenstein Rice Krispie Treats do just that, don’t ya think? Now I already know that when I post these I’ll get comment or e-mails about them being unhealthy and full of “this and that”. Well I suppose it’s all in how you make them really. Eyes — I don’t know about this one, sorry. For the ones you see here, I just used regular rice krispie cereal, large marshmallows, unsalted butter, melting chocolate wafers, yellow food coloring and blue food coloring along with a few candy eyes that I found at Hobby Lobby! Melt the butter in a large pot and add the marshmallows. Stir until they are all melted! Add in the food coloring and stir until it turns green. Add rice krispie cereal a little bit at a time and stir to combine. 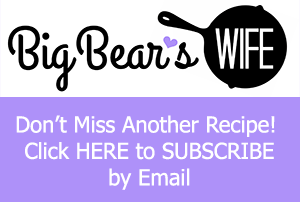 Press rice krispie cereal into a buttered 9 x 13 pan. Press flat and let cool. Let rice krispie treats sit for about 30 minutes. Remove from pan and cut into squares. Melt Chocoalte according the package directions. Dip the tops of the Rice Krispie Treats into the melted chocolate. Lay on a sheet of wax paper (or a plate). Use some of the melted chocolate and \"glue\" on the candy eyes. Fill a ziplock bag with some of the melted chocolate, snip an end off and pipe a stitch mouth onto Frankenstein. 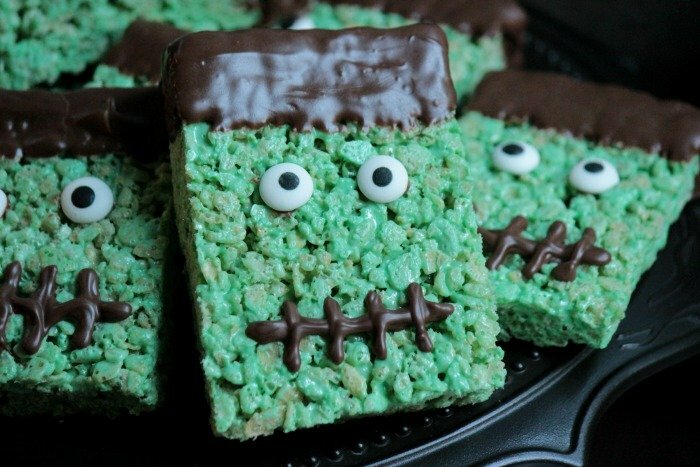 Let the Frankenstein Rice Krispie Treats sit for about 20 minutes undisturbed or until the chocolate had hardened. These are adorable! I love their little eyes…did you find those at Michaels? I found some at Walmart in the craft section with the other Wilton cake decorating items. Party City also has them. Another “touch” would be to “glue”(using frosting) mini-marshmallows on the sides to represent the bolts in his neck. 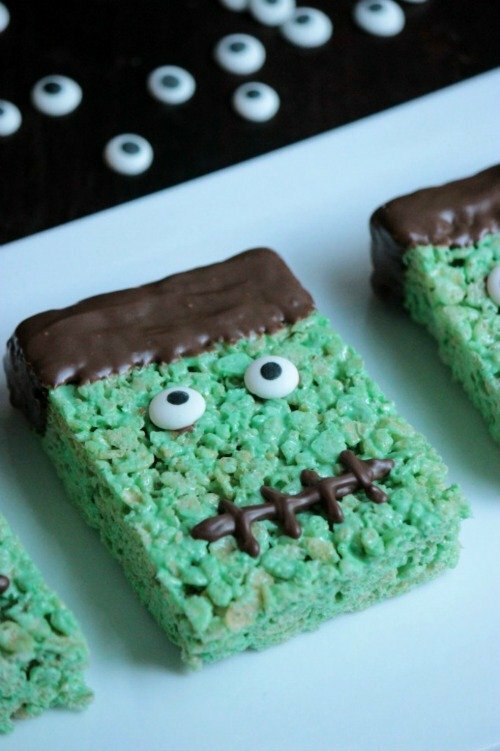 How adorable are these rice krispie treats?! My kids would love them! 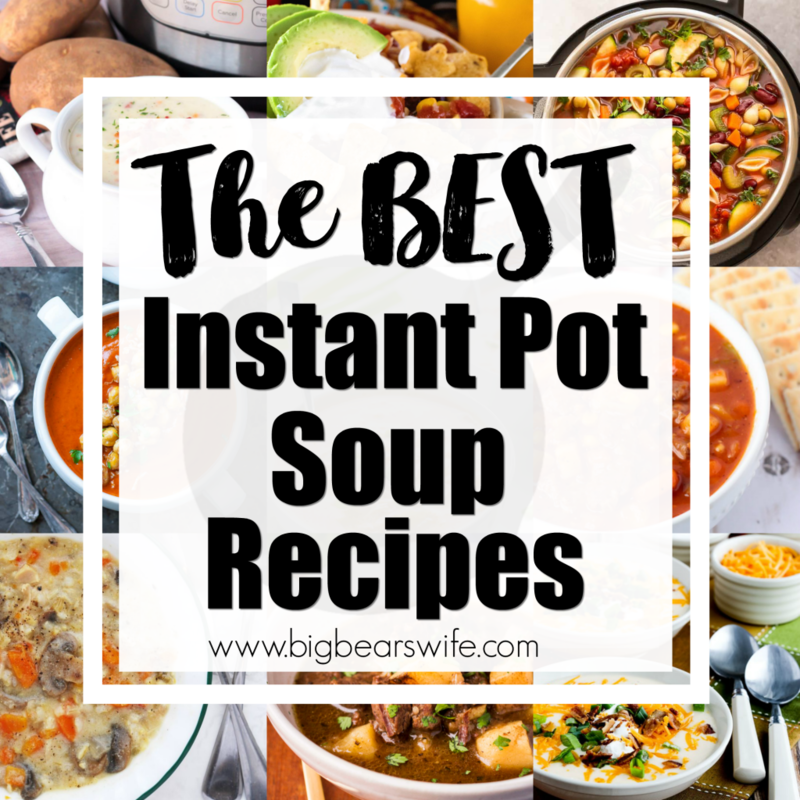 Squeeee – these are so much fun! And since I don’t make rice krispie treats very often, I always revert to the perhaps-less-than-healthy ways of my childhood ;). 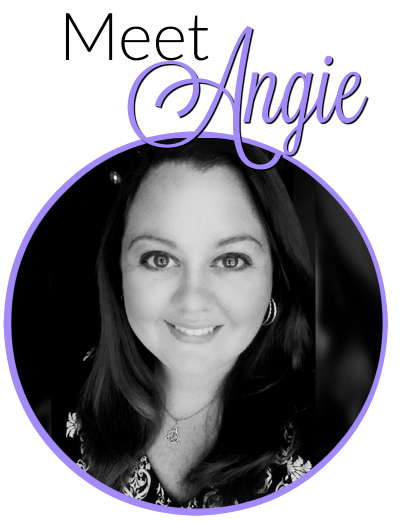 Angie you never cease to amaze me. So stinkin’ cute. My kiddos would love this. OMG! These are too cute! I love Halloween and your Frankensteins! I have to pin them so I don’t loose ’em. Halloween is my favorite holiday! 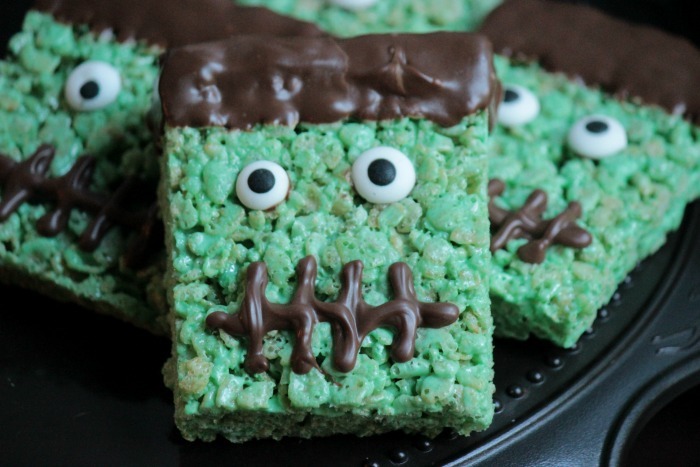 And those Frankenstein Rice Krispie Treats? So adorbs! HaHaHa! These are just too darned cute!!! These are too cute! I need to make these and mail some to my 3 year old niece! Angie, these are too cute! I love using the “Ogly, googly eyes” on baked goods, just makes me giggle! OMG! These are sooooo cute and soooo making an appearance at Pre-K! These are so stinky cute I can barely stand it. I love your make it healthier notes. The eye one made me snort. I suppose people could try low fat cream cheese and low sugar or no sugar candy cut into a circle. I’d make the full fun version for Halloween personally. So stinking cute. Went and got the ingredients and “eyes” to make theses. But to be different, and because purple is my favorite color, my Frankenstein will have purple white chocolate hair. These are just too cute. haha I bet Purple hair will be awesome!! Need a little more practice and should have read up on dipping in white chocolate chips before I started instead of after. But we had fun and they are tasty, so it was a sucess. Thanks for the inspiration. Aww they are cute! Love that you came back and shared them. So fun! I’m featuring them tonight in my Friday Features. 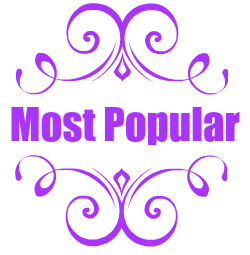 Thank you for linking up to Inspire Me Monday. As a fellow infantry wife, I’m wondering if I can send these to my hub overseas! Do you know or have any suggestions of something that can last about 8 days in shipping? Thanks! Can I use green food coloring instead of mixing the two colors? I’m making these tonight for my son’s preschool halloween party. I can’t wait and can only pay the turn out nearly as cute as yours! Xoxo on a side note. …what has the world come to? Why does everything have to be excused and justified and substituted? Whatever happened to plain old moderation and just enjoying life. I understand if there’s an allergy, by all means please substitute. But really, if there’s a party then party! And enjoy! Xoxo I hate feeling like I constantly have to apologise for making something yummy for kids for special occasions. So sorry rant over. I like the way you think!!! 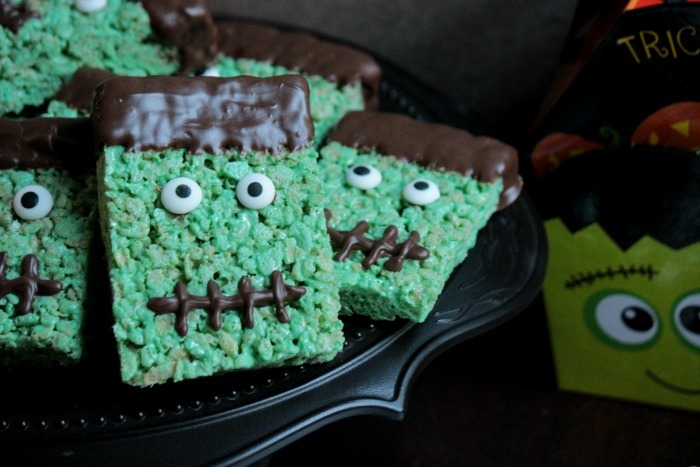 <3 I hope everyone at your party loves the Frankenstein Rice Krispie Treats! I tried to make them tonight with my son and failed. Our melted chocolate was too hot for the plastic bag and when we tried to make the mouth it just came out in globs. I used mini morsels…maybe that’s why? Either way I felt awful because we were making them for my sons party. 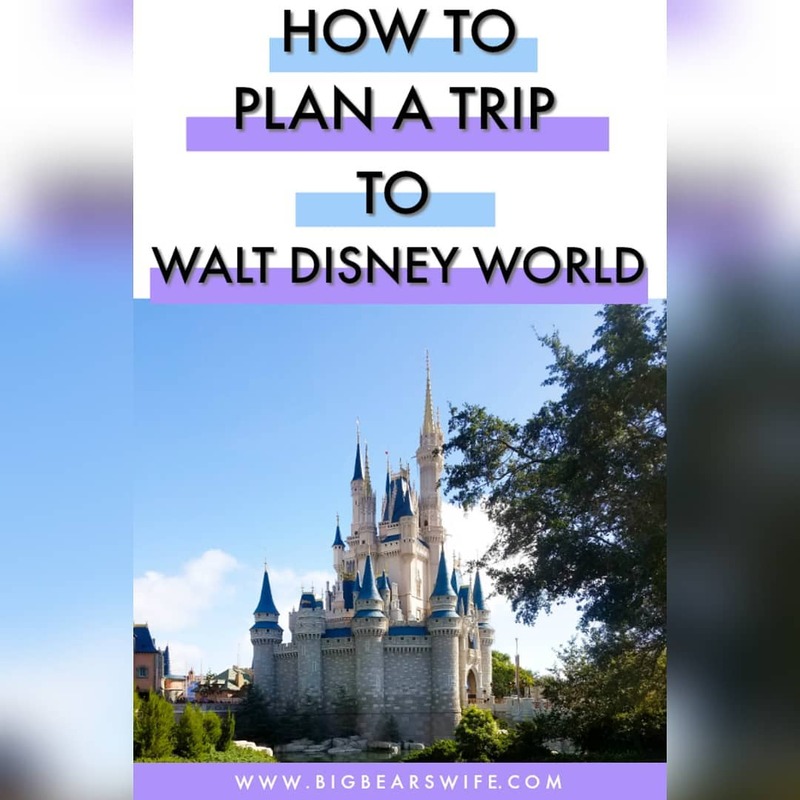 Any tips would be welcome!! hey Raylene, You’ve got to let the chocolate cool down before you try to add it to the bag. I dip my tops and then by the time I dip them all it’s cool enough to touch and then I fill a bag for piping the mouths. Also, I haven’t used mini chocolate chips for these, I use the candy melts because they have oil already mixed in which makes them melt better. 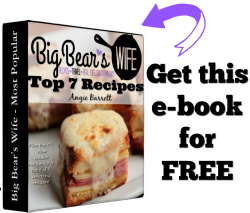 Angie, I love these! They are so adorable. My boys would love them. As a matter of fact, my five year old came up with the idea for bunny poop cupcakes at Easter. I obliged and they are on my blog. LOL!